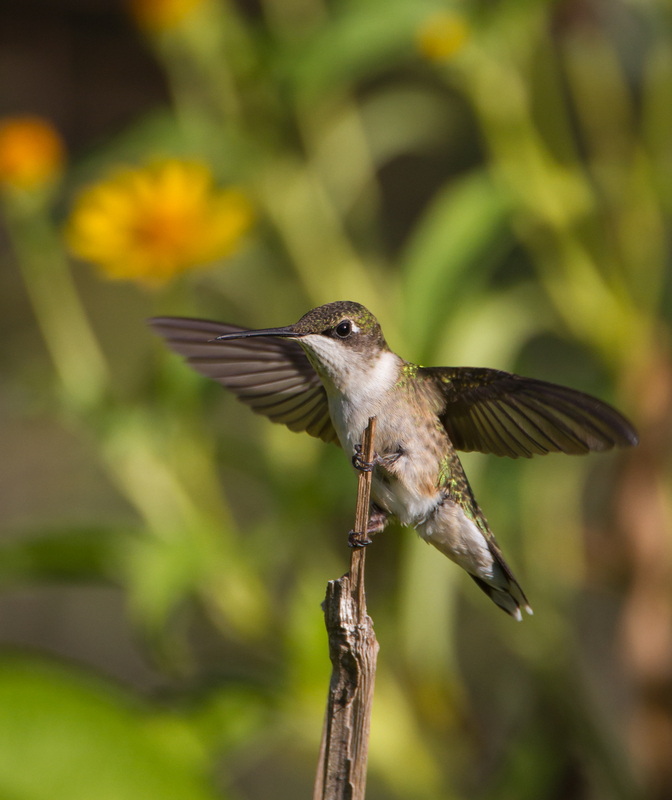 The past few weeks have been amazing in the garden – a daily display of aerial acrobatics from the remaining group of Ruby-throated Hummingbirds. There are four birds feeding on various wildflowers and the three feeders I have out in the garden. Every time I am out there I see and hear the squabbles as these winged bullets streak over and around me chasing one another in a seemingly endless game of tag. It just seems so energy inefficient to spend this much time and effort zooming around as they prepare for their upcoming migration. 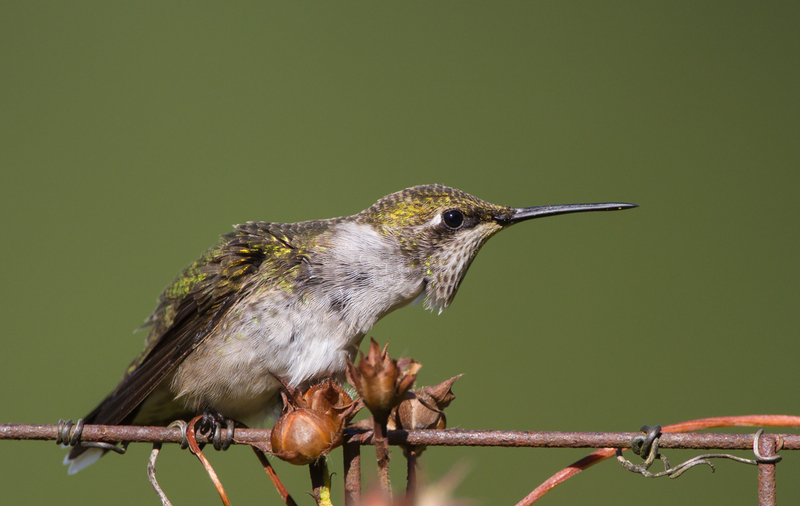 But, hummingbirds may almost double their weight prior to migration, so they must be getting enough in spite of all the ruckus. Each morning for the past few days I have spent some time sitting and attempting to photograph the goings-on. These tiny bundles of energy have some fascinating habits. There are at least two immature males in the bunch and they seem to be the most active. The adult males are the first to leave for their wintering grounds (and the first to arrive back in the spring). I have not seen an adult male for at least three weeks. The immature males mimic females in their plumage (including the white patches on the tail, which mature males lack). But they are beginning to have a few red feathers that will comprise the adult male’s stunning red throat (called a gorget) at maturity. Males develop their full colors on the wintering grounds and will return next spring with their flashy attire. Much of their daily routine involves either active chasing or threat displays. The young male above contorted himself as another flew overhead and then gave chase. This one was puffing up and leaning toward another bird that dared to land less than a foot away on the garden fence. These threat displays often end with a burst of speed that I am currently unable to capture with my camera. I have had them buzz me and almost fly into my car window which is what I am using as a “blind” for these photographs. 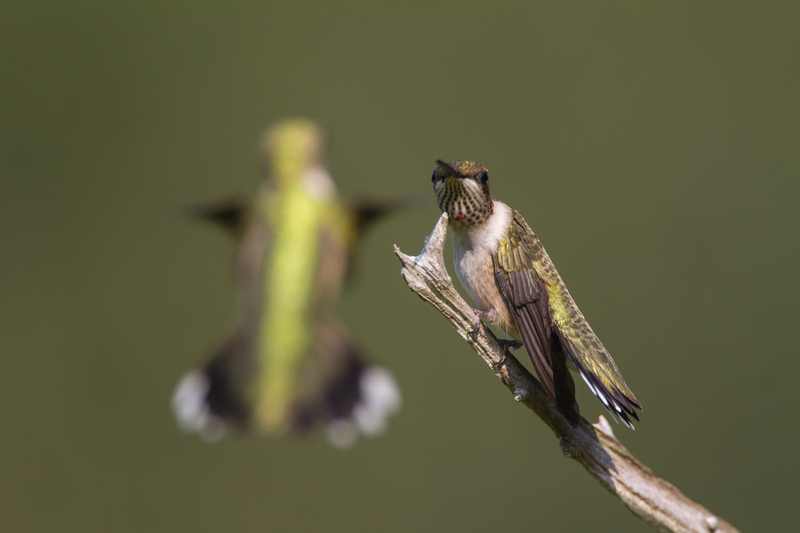 They will often fly straight up for 30 or 40 feet in an aerial standoff before jetting off into the tree tops. 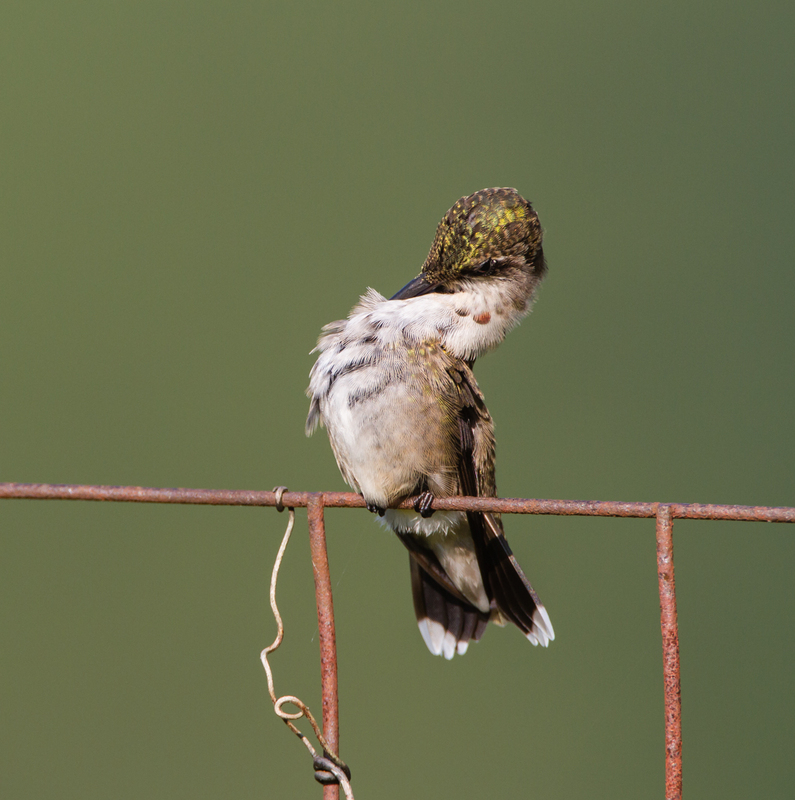 When not fighting, they often settle on a favorite perch (this can change daily) and tend to self-maintenance issues. They preen and ruffle their feathers and they spend a lot of time scratching with those tiny feet. They often rub their bill against the wire fence, a twig, or anything handy. One bird often sits near a morning glory vine and seems to probe the various parts of the plant with its bill as if checking for something. Following a short bout of preening they often flick their tongue in and out a few times before moving on. You can certainly see how they can reach deep into tubular flowers for a meal. 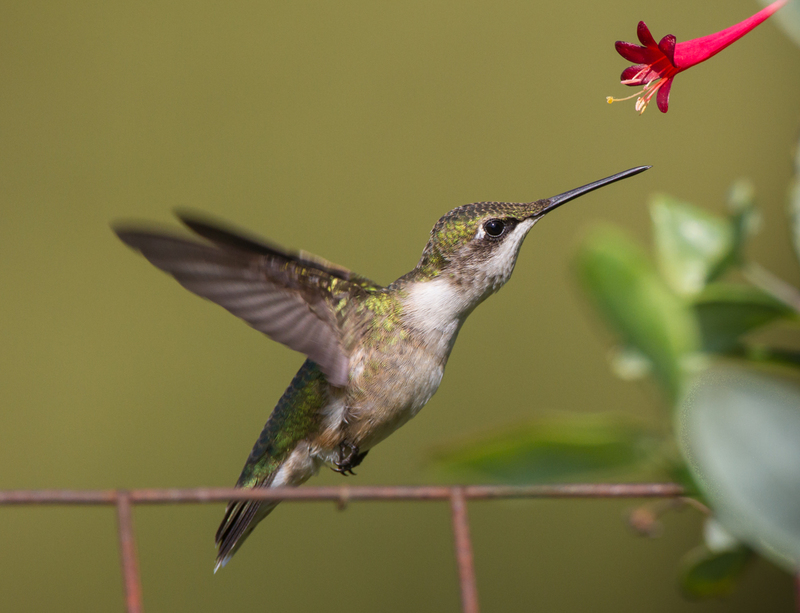 Their hovering ability is one thing that makes hummingbirds so magical. Their wings beat and incredible 60 to 80 times per second in normal flight, faster in courtship dives. The thing most of us see them do is hover and feed, either at a feeder or a flower. 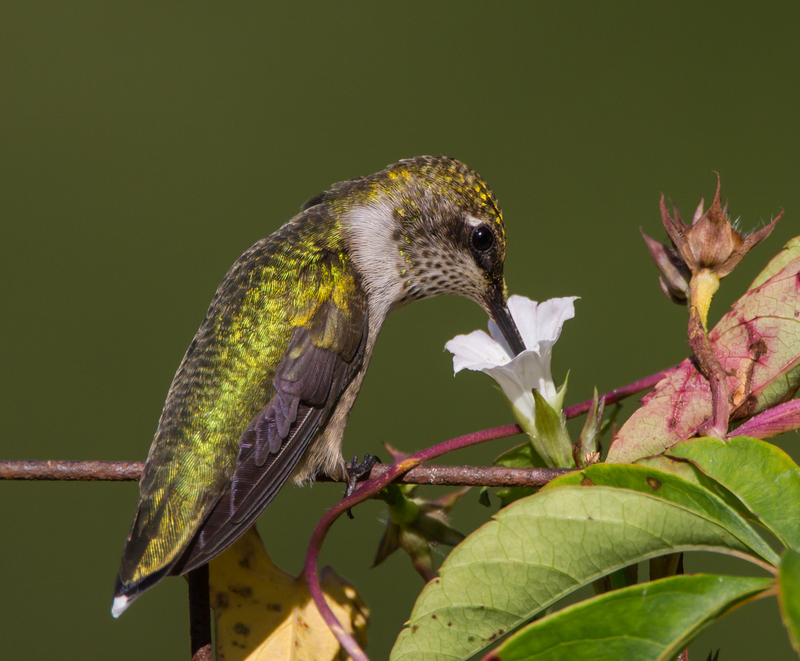 Over the summer they have fed at a variety of plants in the garden including Crossvine, Larkspur, Bee Balm, Cardinal Flower, Coral Honeysuckle, and Morning Glory, the latter two being their primary source of nectar this week. While they usually prefer take-out at the drive-thru, they will sit and eat in if there is a convenient perch near a nectar source. This young male visited this flower several times yesterday morning, always feeding at it while perched. My garden guests will be checking out soon and headed for their winter homes. 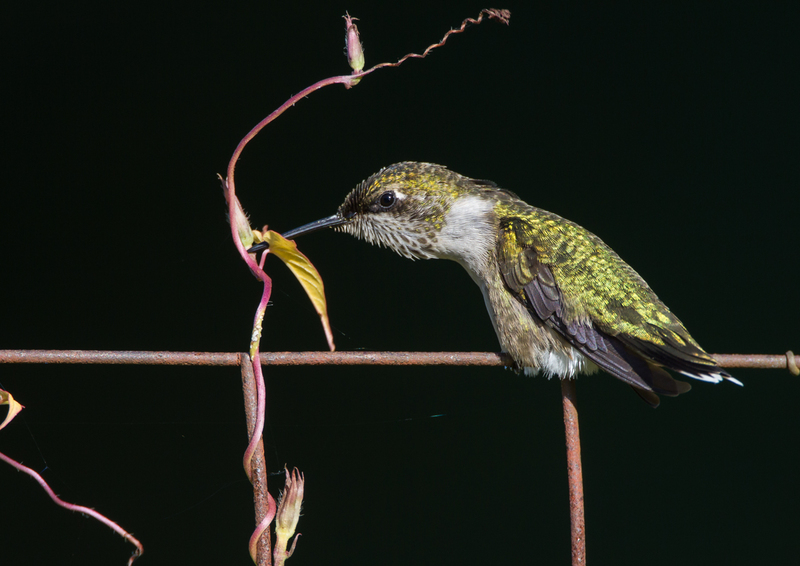 Most Ruby-throated Hummingbirds spend the winter in Mexico and Central America. 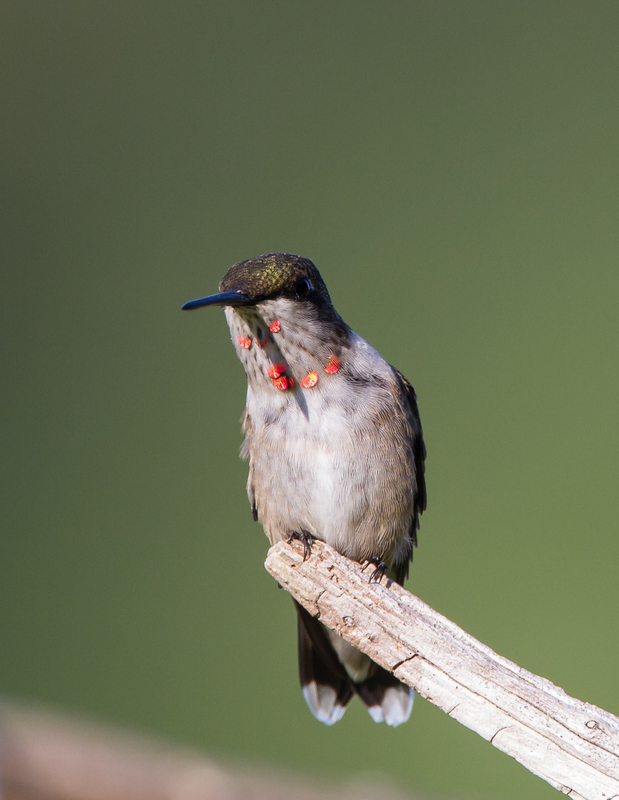 The Ruby-throated Hummingbird is North Carolina’s only breeding hummingbird species but recent research has documented several species (eleven the last I heard) that occasionally occur in our state, especially in winter. 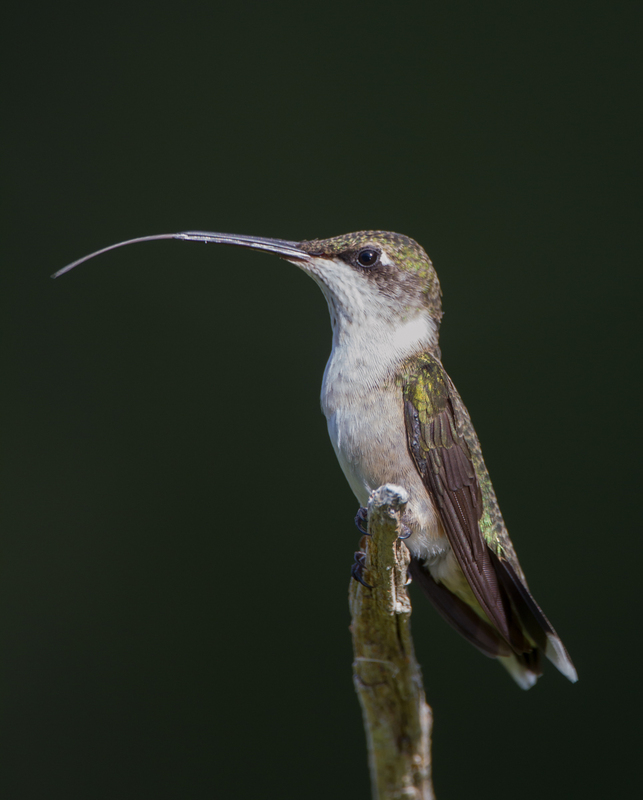 But most likely, once these few are gone, I won’t be seeing another hummingbird in my garden until the adult male’s arrive next March or early April. The garden won’t be the same without them. 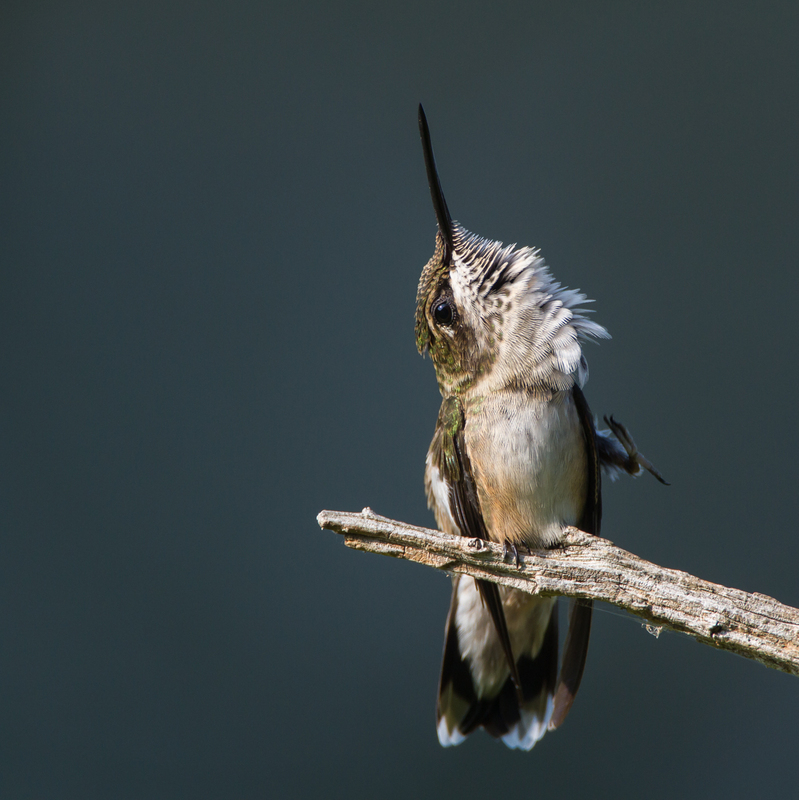 This entry was posted in Attracting Wildlife, Natural History and tagged behavior, ruby-throated hummingbird by roadsendnaturalist. Bookmark the permalink. Thank you, Mike, for these moments of grace. 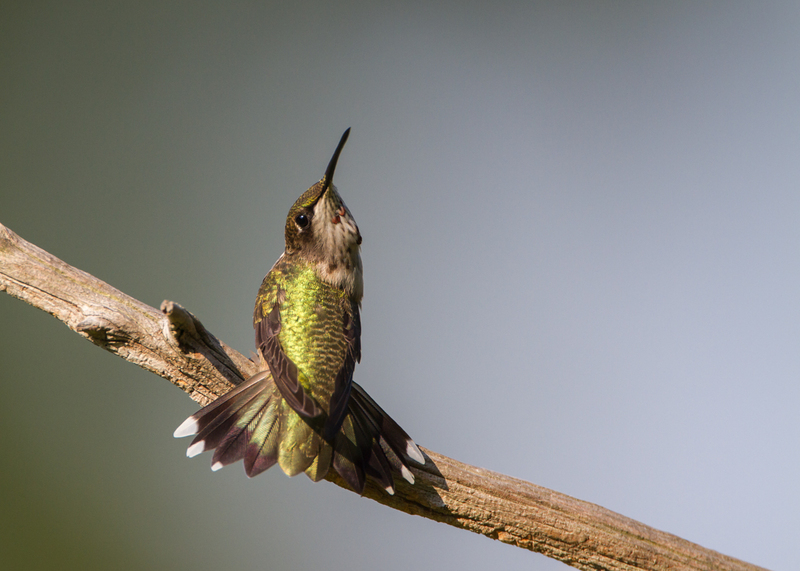 Breath-taking photography (as usual for you) and fascinating natural history of the hummers. Gifts, everywhere. 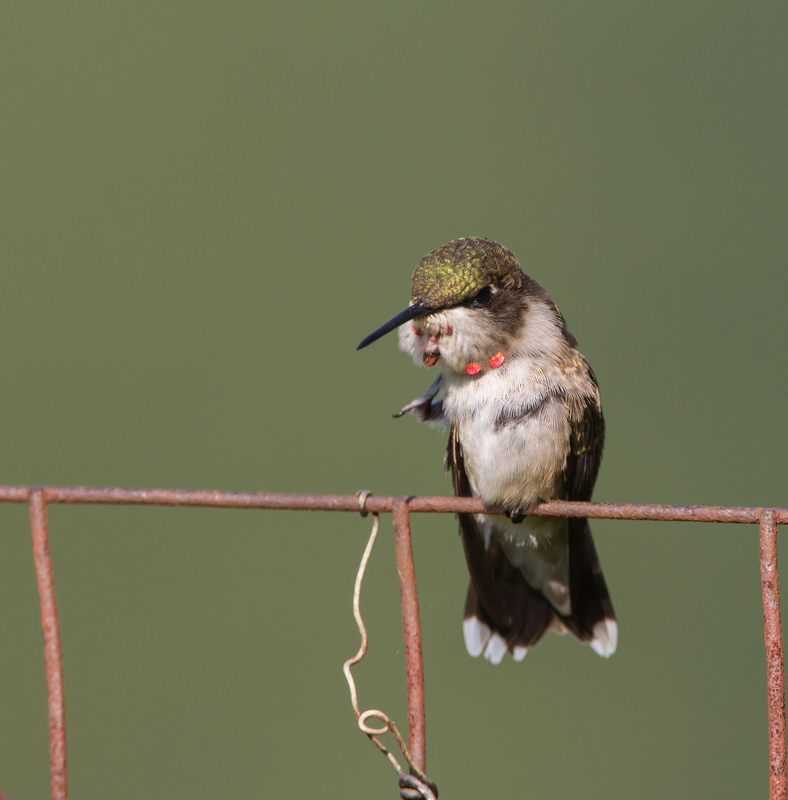 The immature hummer’s throat with only a few spackles of fiery red is my favorite!! Thanks, Ina. It is a pleasure to watch these balls of energy zip around. One was one 1/800 the other 1/640… Neither still fast enough to freeze it. Still pretty darn good! I never even seen them scratch, let alone catch it with the camera. This was sooooo superb!! I absolutely LOVE hummingbirds, and learned a lot, too!! wonderful photos Mike! I look forward to reading your blog every day! Thanks, Wendy. I am having a lot of fun doing it. Looking forward to when the birds return down your way.